On Tuesday 18th September 2012, history was made when the Melbourne Football Club offically launched the Ron Barassi Bequest Society in the Jim Stynes Room at the MCG. A select group of the Club’s longest serving members were honoured to attend this exclusive afternoon, hosted by Ron Barassi, alongside the ever entertaining Chris Connolly. Barassi said he was extremely provileged to be involved, urging attendees to consider leaving a Bequest to assist the Club in years to come. “I am really passionate about ensuring the future success of this great Club, and to see it return to its former glory” he said. Every heart beats true for the red and the blue… time passes, names change, but we all have one thing in common, the love of the Demons. 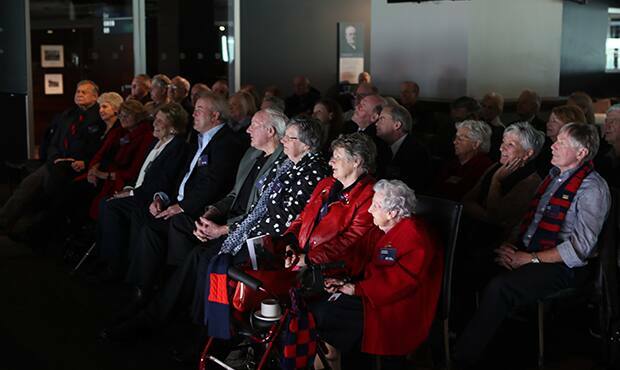 Making a bequest to the Club is a unique way of supporting the red and blue football family, without impacting on your present income. Bequests will help secure the future of the Club. All past, present and future supporters of the Melbourne Football Club who are interested in the future of the Club now have an opportunity to play a vital and integral part of the Club’s future successes. When you and your family are planning your estate you want to provide for the people and causes closest and dearest to you. Once you have provided for your loved ones, please consider making a gift to the Melbourne Football Club. We recommend that you consult your legal advisor and discuss these important decisions with your family and friends. By leaving a bequest today, your bank balance will be exactly the same tomorrow. View the Ron Barassi Bequest Society brochure HERE. 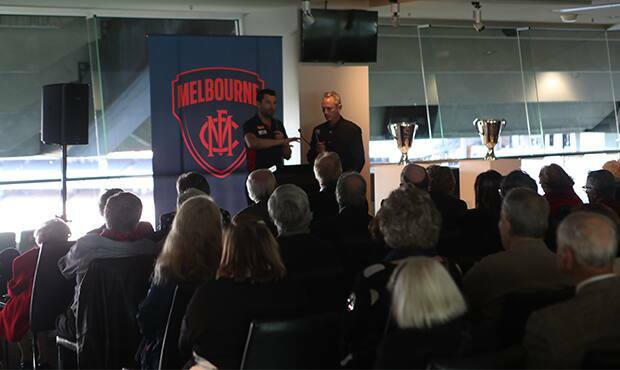 In May 2018, we held a combined afternoon tea for our 50 year members and the Ron Barassi Bequest Society at the MCG. Ian Munro was a guest speaker, along with Angus Brayshaw, Christian Petracca and Hassa Mann. Ian told a great story about his connection to the club and the reason why he joined the Ron Barassi Bequest Society. A summary of the story can be found below. As a result of my father’s practice of buying glossy reprints of newspaper photographs to commemorate Melbourne’s grand final victories our house was a gallery of triumphant Demons. Our living room was decorated with these images: the Cordner brothers and Jack Mueller exhausted but jubliant after the final siren in 1948; Noel McMahen carried aloft on the shoulders of team mates after the great victories of 1955 and 1956; Ron Barassi airborne and his back arched to clinch a screamer in front of an Essendon opponent in 1957. Or was it 1959? And the great Norm Smith clutching the premiership cup as John Lord looked on. That must have been 1964. As well there were the Herald newspaper banners bearing the work of the cartoonist Bill Green - Weg to his fans - recording those victories. Somehow we had two copies of the 1960 poster which is supposedly the rarest of all since the heavy rain that day destroyed many of the banners that were displayed outside newsagents. In such an environment there was no alternative to growing up red and blue. Besides, the Demons were synonymous with success. Every week from autumn to spring we ventured to the MCG to sit in the Grey Smith Stand, or to Arden Street, Brunswick Street, Punt Road or the distant Kardinia Park. Wherever the Demons were playing was where we would be found. Yet we knew that there had been lean years too. That was part of the rich history that unfolds before us still. Passing through the old Members’ Pavilion some years ago my father paused at a photograph of the MCG taken between the wars and casually pointed out the position near the fence from which as a small boy he had watched Melbourne - then called the Fuschias - defeat Collingwood in the 1926 grand final. Through such memories we realise that the club is woven into the fabric of our lives and our families. In our case the link runs through my father to his grandfather, the Melbourne Cricket Club member who introduced my father to the red and navy blue. Perhaps our tie runs back even to the original premiership in 1900? I chose to make a bequest to the Melbourne Football Club because preparing a will is about providing for, and acknowledging those people, those causes and those institutions that have shaped you, given your life meaning or pleasure that you would like others to share. First thoughts are of immediate family, of course, but life is enriched too by those links between generations. In our case the Melbourne Football Club is one of those links. The Club has given enormous pleasure in its victories and taught valuable lessons in defeat. It is as much a part of our lives in hard times as it is in good times. It is an enduring tie that my children share with the generations that came before them. It is part of who we are which is why I chose to acknowledge the Club with an endowment.